Woman's Day published a series of inserts on various collectibles. 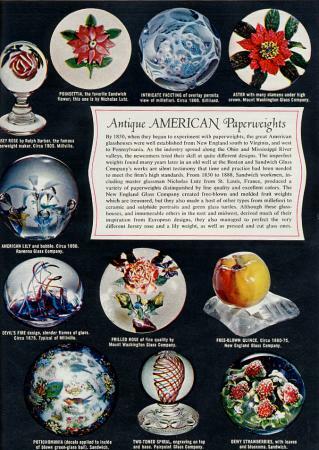 This eight page insert in full color was a pivitol article in the history of paperweight collecting. A copy of the magazine article was given to Stuart Drysdale when he was managing Strathearn Glass in Scotland. The article the inspired him to improve the quality of the glass paperweights made there and eventually to leave Strathearn and found Perthshire paperweights. 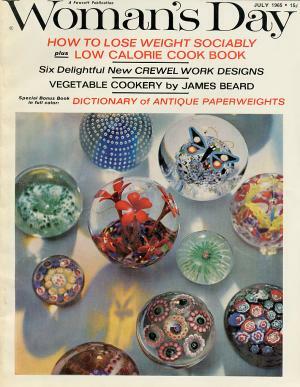 Note: The paperweights on the cover of the issue are not related to the article. They are identified (incorrectly) on the contents page as being late 19th century American paperweights from the collection of the New York Historical Society. 8" by 11" format. The article is 8 pages long in full color. Used copy with appropriate wear and aging. Click on the picture to see a page from the article.